Working waterfronts are constantly in flux; crusty, utilitarian, muscular and dissolving, with temporal qualities that engage all of our senses. Yet contemporary waterfront redevelopments are often characterised by the removal of the very qualities that attract us to these places. 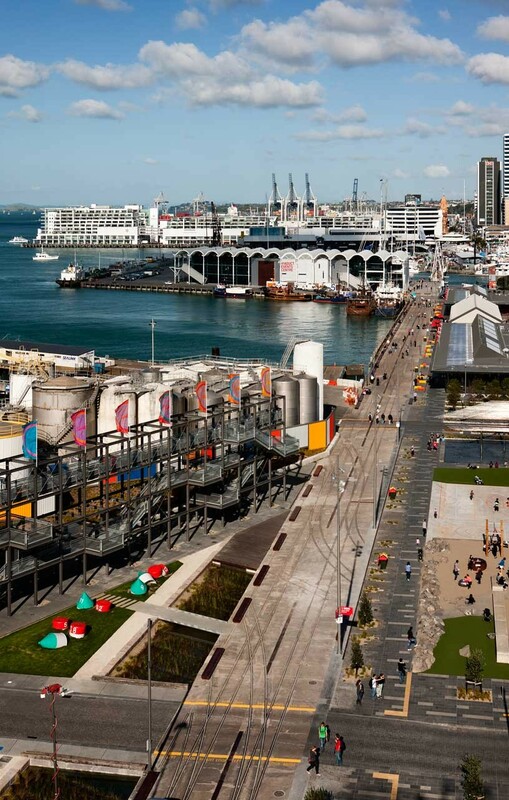 At Auckland’s Wynyard Point redevelopment these conventions are challenged in a development that anticipates transforming a forlorn industrial and maritime precinct into a layered, mixed-use precinct. 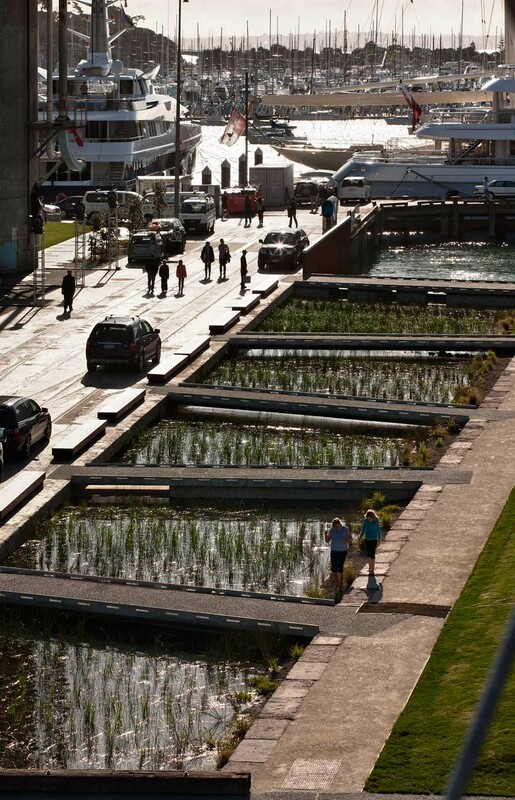 The first catalytic projects of this redevelopment are public spaces centred on Jellicoe Harbour and Silo Park. These spaces promote an alternative design approach to the typical erasure of waterfront memory. Here, friction is encouraged, smelly fish are the attraction, rust, grit and patina are embraced and derelict artefacts are reprogrammed. The design weaves public realm experiences around these ‘as found’ conditions. The harbour edge, North Wharf Promenade, is now a site of negotiation, a pedestrian and cycle promenade from which to witness and experience the coexisting waterfront industry. It is also a site of contrasts with the patina of wharfs, rails, rust and ropes juxtaposed with the adjacent lustre of alfresco dining that has thrived in this authentic waterfront condition. Jellicoe Street runs parallel to the harbour edge and contrasts with the exposed, hard harbour condition. This ‘boulevard’ establishes a new public realm language for Auckland, one that promotes a civic presence with an indigenous character; a grand axis with a pedestrian focus and rich, informal planting. 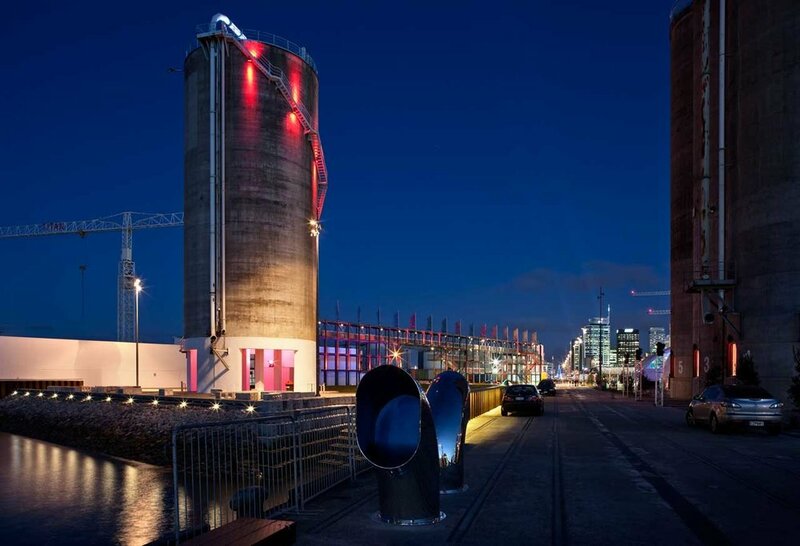 Silo Park is a triangular tract that links Jellicoe Harbour with marine industries to its west. It is located on a former cement depot from which a large silo – once earmarked for removal – is retained. The silo now forms a multi-programmed focus of a layered public space that facilitates a range of hybrid uses; passive recreation, event space, youth precinct, industry and folly. Each program is new to the site, yet built from the pattern language, infrastructure and the mythology of place.